This David and Goliath story between Alibaba and EBay, Google, Chinese bureaucracy, and the rest of the world is an absolute delight to read. Porter Erisman has crafted an insider’s loving portrayal of the world’s largest e-commerce site, from its humble beginnings in Hong Kong and rural China to its present-day dominance of the online China trade. Erisman came to Alibaba in its infancy as a Chinese-speaking, American-trained PR guy. His first stint with the company ended during one of its many cash crunches. He returned, and was at Jack Ma’s side as Ma coolly and calmly conquered the world. Ma might have been small in stature but he was massive when it came to ambition. Not the snarky, sharp elbow ambition we associate with Silicon Valley or Wall Street. Instead, Ma’s desire to grow a China-based Internet company was rooted in a sense of service to his countrymen as well as the universal desire to get rich. The story is replete with fascinating moments in Ma’s career, which ultimately became huge turning points in the history of e-commerce. Before he was a businessman, Jack Ma was a tour guide, and one of the people he ushered to the Great Wall of China was Jerry Yang, the Taiwan-born founder of Yahoo!. Erisman details the story of how the Ma and Yang became friends and ultimately joined forces to defeat EBay in China, no small undertaking, given the size and scope of EBay’s worldwide operations. Erisman writes that EBay could not have been more culturally tone deaf as it sought to dominate in China. It sought to impose its western brand of online trading, whereas Chinese businesspeople were used to establishing a sense of trust instead of negotiating blindly with an opponent they had never met. Later, when EBay sought to create a single worldwide platform, it junked all of the features to which its Chinese buyers and sellers had become accustomed, opening the way for Alibaba and its e-commerce trading site, Taobao, to win the hearts and minds of its countrymen. There’s an entertaining moment, although it probably wasn’t so entertaining at the time, where the prickly, adversarial Google leaders, Larry Page and Sergey Brin, meet Jack Ma, Porter Erisman, and a few other members of Alibaba’s leadership in a snack-and-document-strewn conference room in a hotel in a mainland China hotel. The Google guys didn’t even understand what Alibaba’s business model was. The only conclusion that Erisman and his team could draw was that eventually Google would try to swallow them up. It’s said that even the paranoid have enemies, but you didn’t have to be paranoid to have EBay and Google breathing down your neck as you were trying to launch a capitalist system, e-commerce, in an ostensibly communist country. The book is written in a fresh, engaging style that creates a sense of immediacy and empathy for Alibaba’s team. While there was nothing easy about Alibaba’s rise, the book is certainly replete with lessons for any western (or eastern) business leader who wants to get a big company off the ground with few resources and enormous challenges. 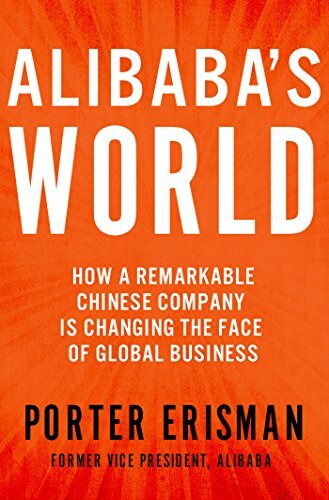 If you like a well-written business yarn, read Alibaba’s World. It’s how the East was won.